The word "Advent" comes from the Latin words "ad" (to) and "venire" (come). In these next four weeks, we prepare our hearts and our world to receive the coming of Christ, while at the same time keeping mindful of the time when Christ will come a second time. "Be Watchful" is the mantra of Advent. Our first reading from the Prophet Isaiah (IS 63:16-17, 19, 64:2-7)comes from a time when the Jews were returning from exile in the 6th century BC, only to find their temple and nation in ruins. Isaiah's prayerful lament is a plea to the Father to come, and return his chosen people to right relationship with their God. Isaiah closes his prayer with an act of complete surrender, "We are the clay and you the potter". Could it be that Jesus is the answer to Isaiah's prayer. You, LORD, are our father, our redeemer you are named forever. Why do you let us wander, O LORD, from your ways, and harden our hearts so that we fear you not? Return for the sake of your servants, the tribes of your heritage. Oh, that you would rend the heavens and come down, with the mountains quaking before you, while you wrought awesome deeds we could not hope for, such as they had not heard of from of old. No ear has ever heard, no eye ever seen, any God but you doing such deeds for those who wait for him. Would that you might meet us doing right, that we were mindful of you in our ways! Behold, you are angry, and we are sinful; all of us have become like unclean people, all our good deeds are like polluted rags; we have all withered like leaves, and our guilt carries us away like the wind. There is none who calls upon your name, who rouses himself to cling to you; for you have hidden your face from us and have delivered us up to our guilt. Yet, O LORD, you are our father; we are the clay and you the potter: we are all the work of your hands. Now that we are in a new liturgical year, our Gospel readings will mostly be taken from the Gospel of Mark. Our Gospel passage (Mark 13:33-37) is yet another reminder to be watchful for the master's return. Jesus said to his disciples: "Be watchful! Be alert! You do not know when the time will come. It is like a man traveling abroad. He leaves home and places his servants in charge, each with his own work, and orders the gatekeeper to be on the watch. Watch, therefore; you do not know when the Lord of the house is coming, whether in the evening, or at midnight, or at cockcrow, or in the morning. May he not come suddenly and find you sleeping. What I say to you, I say to all: 'Watch!'" Our Epistle reading (1 Corinthians 1:3-9) comes from the opening of St. Paul's letter to the Church in Corinth. In Paul's greeting of thanksgiving, he reminds us that God has already given us every spiritual gift to sustain us as we wait for the revelation of Jesus Christ. Not the least of these gifts are the Mass and the Sacraments of Eucharist and Reconciliation. We might tend to think that the only "advent" of Christ would be at Christmas and at the end times; but there are countless advents every day, every week, every month. Advents of Jesus in the Eucharist, advents of the Spirit through insights during Mass or during prayer. Sometimes, these advents are lost on us simply because we are not aware, not watchful, not attuned to the Spirit knocking on the door of our hearts. 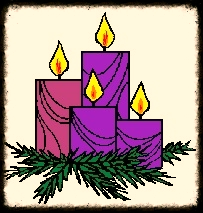 May we be, in this season of Advent, watchful, alert and attuned. Come, Lord Jesus, Come!